Coral reefs are among the ocean's most complex and biologically diverse marine ecosystems. 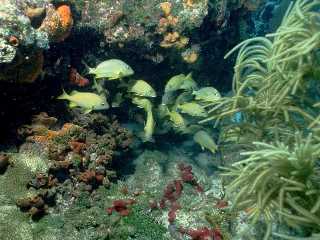 They are underwater communities that are very important to the food chain. In certain areas of the ocean, not too far under the surface where sunlight can still penetrate, are beautiful gardens of coral and other organisms in all the colors you can imagine. These gardens are ever-changing with the colorful coral polyps swaying back and forth in the water, live organisms, and vibrant colors of the fishes that dart in and out of the coral formations looking for food or hiding from predators. Coral reef ecosystems have been referred to as Rainforests of the Sea, because they support a tremendous abundance of life and biodiversity on our planet. 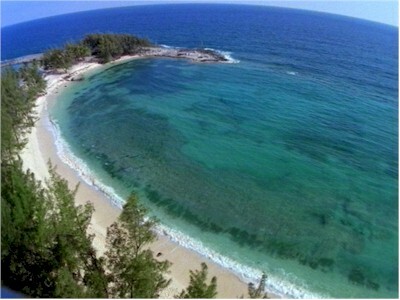 The word "reef" is sometimes described as a chain of coral, rocks, or a ridge of sand at or near the surface of water. In some reefs, coral may actually make up less than half of the material, with other organisms binding the various components together as a habitat (like a colorful lively underwater city full of life). Stony corals are the main builders of reefs, as their hard calcareous skeletons are self-produced. Coral structures are formed from live coral animals called polyps, which are related to jellyfish, hydras and sea anemones. These tiny beautifully-colored animals have stinging tentacles which sweep back and forth in the water catching microscopic animals. As they do this they take in calcium from the seawater and extract and deposit calcium carbonate (limestone) around the lower half of their bodies. This limestone becomes hardened and develops into many shapes and patterns over time. When old polyps die, they become part of the skeleton formation. New polyps come from either eggs or from growths on polyps called buds. These young polyps continue to build on existing coral structures, or they "leave home" to begin new colonies of limestone coral formations as they deposit calcium carbonate from their bodies. As these limestone skeletons are continually created, from dead and living coral polyps, the limestone may form into tubes, domes, branches, fan shapes, or any variety of structures. As more coral animals develop and secrete limestone, the formations build on each other and become larger and larger, forming a chain or reef. Reef-forming coral polyps must have a special food released by a single-celled algae called zooxanthellae. These tiny plant-like organisms live inside the tissues of the coral, providing nutrients. Zooxanthellae also helps them secrete limestone and removes waste. This biological partnership between the coral and the algae is a process called symbiosis (a close ecological relationship). They benefit each other through this relationship. The algae take in carbon dioxide and release oxygen into the water. Enough light must penetrate the water for photosynthesis to occur in the algae, so the water must be clean and clear. Reef-forming corals cannot live in water that is below 65°F (18°C). This is why you find coral reefs in shallow, warm tropical seas. After a very long period of time (thousands of years), these tiny coral animals can build massive reefs, and even build islands! This happens from layers and layers of millions of coral skeletons becoming encrusted together to form hard limestone structures. Many South Pacific islands were built by these tiny coral animals. But environmental conditions had to be just right for this to happen. The Great Barrier Reef was formed in this way. The Great Barrier Reef is actually comprised of a complex of about 2,900 individual reefs, stretching out for a distance of approximately 1,400 miles (2,300 kilometres). There are other kinds of coral besides stony coral. The Precious Coral species form internal skeletons, and this hard substance can be polished into jewelry. Some coral grow in colder water, but they only grow in small groups. Some small patches of coral can be found even as far north as the Arctic Circle. Unlike the tropical reef-forming corals, deep-sea cold-water coral polyps do not form a relationship with photosynthetic microorganisms, such as the single-celled algae. They grow very slowly (less than one inch per year) at depths of 650 ft. or more, where no sunlight reaches. Not much is known about the deep-sea coral and other organisms in deep sea marine ecosystems. What we do know is that coral communities are immensely important ecosystems that provide life support to a tremendous abundance of marine life. They are a crucial component of the marine food web!